"The Lord will surely not judge you, but I shall. Guilty of being a man, when we should have been gods!" Oh wait, I don't bloody know you people. To date, Isao Takahata's Only Yesterday (1991) is the only theatrical Studio Ghibli feature yet to receive (or be scheduled for) an English-language dub or US release. During a Q&A back in 2005, Disney's Rick Dempsey, who directed a number of the English dubs of Ghibli films, explained that the adaptation had been shelved indefinitely because the original movie was more for adults, and if and when it did get a US release, it might be subtitled-only. This surprised me, considering that Disney found a way to bring over Pom Poko (1994), despite it featuring tanuki testicles on display for pretty much the entire movie. I didn't think any Ghibli movie could pose more of a marketing challenge for Disney than that one (well, except for Grave of the Fireflies, which Disney never had the rights to anyway). But maybe it's because of the lengthy episode centered on menstruation, or maybe it's that the father comes off abusive in one scene. Or maybe Only Yesterday just wouldn't be that compelling to Disney's target demographic of children. Whatever the case, it's a shame that this film remains unavailable in the US. I was able to view it when Turner Classic Movies aired a subtitled version in 2006, despite it not having an official US release. What I found was an unforgettable movie unlike any other Ghibli had ever done, unlike anything else I had ever seen in animation. Based on a manga by Hotaru Okamoto and Yuko Tone, Only Yesterday tells the story of Taeko, a single woman working in Tokyo, who, while vacationing in the countryside, finds herself flashing back to memories from when she was in the fifth grade. The original manga was a compilation of episodes about only the child Taeko, but the movie shifts back and forth between the adult Taeko in 1982 and the flashbacks set in 1966. In either setting, moments are drawn and discussed with a delicate realism seldom seen in animation. Takahata devotes time and startling attention to detail to such simple scenes as characters eating pineapple or picking safflower. If you were one to count cels, then you might regard his allotting so many to realizing such mundane moments to be a wasteful expenditure of labor and run time. And yet, where seeing the Catbus in Miyazaki's My Neighbor Totoro may have made me think, “I've never seen anything like this before,” these meditative sequences in Only Yesterday, though much the opposite of the Catbus, nevertheless evoked in me a similar reaction of “I didn't know you could do that in animation.” Indeed, these quiet, reflective scenes, for all their simplicity, have a mood and a power to them that you'll find almost nowhere else in the medium. The flashbacks contain occasional whimsical flourishes, as when a blushing Taeko's emotional state, following her first awkward romantic experience, is illustrated by her rushing off in the direction of the drawn background, but then, without missing a step, seemingly running along the surface of the animation cel itself, her feet lifting off the painted road, before she then proceeds to swim through the clouds toward sleep and dream. These touches charmingly depict the way a child's imagination can warp reality, as well as how the memories of childhood can be further tinted by nostalgia looking back. The memories themselves are slices of life, not dramatic turning points. The flashbacks come to Taeko as she approaches a crossroads in her as yet unfulfilled adult life, but we are not meant to understand that her tenth year was her most pivotal, when this or that wrong turn or fateful decision determined the trajectory of the rest of her life. My favorite part of the movie comes when child Taeko is overjoyed to be offered an acting gig, only to have her own father forbid her going into showbiz. Cutting back to the present, Taeko's friends, having heard her tell the story, remark on the cruelty of her father to stand in the way of her dreams. But then Taeko reminds them and us that a whole seventeen years passed between then and now, and, in high school, she did try acting, only to find that it wasn't for her. But if it ultimately didn't shape the outcome of her life, then why was this memory featured for our consideration above, say, one from her high school attempt at acting? Perhaps a memory doesn't have to be especially consequential in order to be personally meaningful. And, to be sure, Takahata's approach is, above all else, deeply personal. Some lengthy asides about organic farming notwithstanding, Takahata's movie is brimming with humanity. Now close in age to the adult Taeko, I find myself easily able to identify with the character at both stages depicted. I don't mean the details, but the awkwardness, the loneliness, the restlessness that she reveals upon self-reflection—it all rings so true, as do memories that poignantly blend nostalgia and embarrassment. Reflecting on my own ten-year-old self, what I remember are footraces and essay contests, ice cream socials and Drug Abuse Resistance Education, and the time I should have gotten at least a triple in softball but was instead called out for throwing the bat. Looking at my life now, does any of that stuff still matter? These experiences have never helped me land a job or a wife or, really, anything else beyond the moments themselves. To that extent, they certainly haven't defined who I am. And yet, looking at it another way, those memories are no less my story than any others in my life. I look back and think that maybe those moments did reveal who I was and am, not by defining me, but by how I defined them. At least, for whatever reason, they have stuck with me. I can recall them clearly and still feel now as I did in the moments, as if it were all only yesterday. It was good. Dialogue was sharp, funnier than I expected. As a spectacle movie, it ends up feeling like a lightweight Transformers, never near as exciting as Michael Bay's trilogy (although also never near as obnoxious). After the opening action sequence, in which Loki single-handedly wrecks S.H.I.E.L.D., I think Nick Fury says something along the lines of "This is a level 7," immediately prompting whispers in the audience about what would constitute a level 9 or 10. The situation does later escalate, but, even at the movie's biggest action sequences, "level 7" sounds about accurate by my scale. I was not even convinced that Thor by himself was ever quite having to give 100 percent. The cannon fodder aliens seemed no more dangerous than the entirely earthly threats of Iron Man 2. And Captain America was totally useless. Mark Ruffalo was good as Bruce Banner, although, the way the Tony Stark character has been conceived as an uber-genius in these movies, one wonders why the team would ever need any other scientists. I can see that Hank Pym (AKA Ant-Man) would have been redundant here, but I still hope he and the Wasp are in the next one. And, no, he's not just a guy that turns small and talks to ants; he also has expertise in robotics and AI, and he created Ultron, one of the villains that I personally would most want to see as the heavy in an Avengers movie. Kiki's Delivery Service (1989) was the first Studio Ghibli movie that Disney localized for American audiences. The English version, arriving on VHS in 1998, was a surprise hit, selling over a million copies, and it also played regularly on the Disney Channel. Accordingly, it was also the first Ghibli and Miyazaki movie that I ever watched. At the time, I didn't really like it. It seemed to be a movie about not much in particular, where not a lot happened of any consequence. Watching it again, I now think it's probably my favorite of the Miyazaki films I've covered thus far. 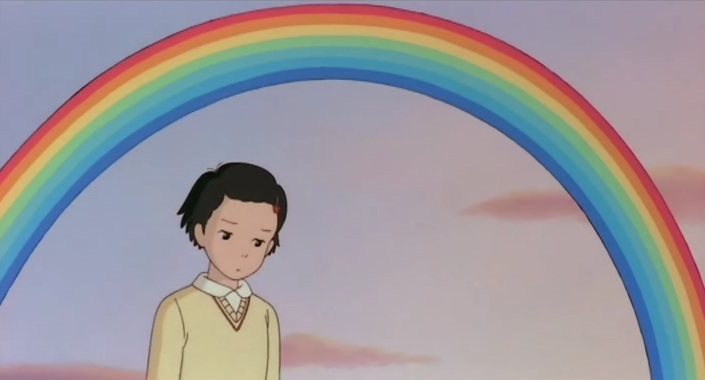 In a departure from his previous Ghibli productions, Kiki's Delivery Service was not an original story by Hayao Miyazaki, but rather based on a popular 1985 children's novel by Eiko Kadono. Miyazaki also did not originally plan to direct it himself, as he was still busy with My Neighbor Totoro (1988) when production began. Dissatisfied with the staff's progress, however, Miyazaki finally ended up writing and directing Kiki himself, and the result was a film that bore many of his hallmarks yet still felt distinct from his previous works. Up to this point, Miyazaki had done a post-apocalyptic epic, a romantic boys' adventure, and a children's storybook movie. Kiki's Delivery Service, meanwhile, was a coming-of-age tale, with slice-of-life elements. The story is about Kiki, a 13-year-old witch, who, at the beginning of the film, moves to the big city to live on her own for a year, as part of a customary rite of passage for young witches. By witch standards, she's not very talented, but, after a rough start, she decides to take advantage of her flying skills to operate a delivery service out of a friendly couple's bakery. The movie's second act then consists of episodes of her settling in, running around town and meeting new people on the job. These were the parts that I originally found dull, probably because there never seemed anything much at stake. Also, most of the people Kiki met just seemed too nice to believe. Shouldn't there have been at least one cynical character always doubting her ability to make it on her own, advising her to give up and run on back home, maybe even working actively toward seeing her fail? 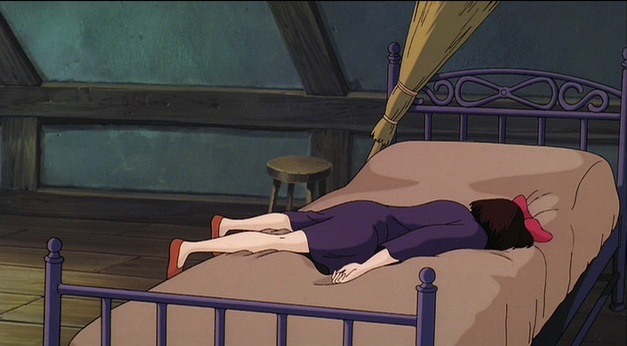 There really isn't any antagonist whatsoever in Kiki's Delivery Service. In the movie, the episodes are tied together within an overarching narrative with adolescent themes of Kiki trying to find her place and herself, but it's easy to imagine each delivery as a short story with its own tidy resolution. They're kind of cute, kind of sweet, and kind of funny. After a long week of work and not much else, I actually found these chapters, slight as they are, quite refreshing. Similarly, I didn't mind the lack of any serious conflict. My favorite scene in the whole movie is when Kiki, coming back from an errand, finds a lovingly designed wreath of bread unexpectedly at the front of the bakery advertising her delivery service. With no dialogue audible, she rushes in to embrace the taciturn baker who crafted it. It's a small scene and maybe a small, inconsequential moment in the grand scheme of the movie. Or maybe it's small moments like these that make one's day and, ultimately, one's life. No, there isn't a whole lot at stake through most of Kiki's Delivery Service, but I guess, to me, that actually lends the story credibility, despite that it stars a witch and takes place in an imaginary idealized European seaside town—by the way, one of the most gorgeously realized fictional settings in any film. It's real enough to believe but still fake enough to enjoy. I apologize if that came across cynical, but I only mean that watching Kiki is like getting a glimpse at what real life ought to be, maybe what it can be, indeed what it has been at its best. It probably helps things that Kiki herself is much easier to relate to as a character than previous Miyazaki protagonists. More fallibly human than Nausicaa, she's clumsy, she can be shallow and superficial, she gets frustrated and even bored. Indeed, that last is maybe the most charmingly realistic aspect of Kiki's Delivery Service—the way it gets life's doldrums. As Kiki starts to settle into life's routine is when she starts to wonder what it's all about and whether there's more. Kiki's Delivery Service is not all a laid-back series of vignettes. When Kiki is invited to ride on the backseat of a human-powered aircraft—basically a bicycle with propeller—the result is one of the more exciting sequences in Ghibli history. And the climactic scene involving a rescue from a crashed dirigible ranks up there with any superhero movie action sequence. Kiki's Delivery Service is more involved than My Neighbor Totoro, but no less heartwarming. It's not only sweet but also a thoughtful movie for adolescents. As Kiki learns, independence is not just about fending for yourself, but about finding an identity apart from where you came from and what you've been given. And, although it may feel smaller than Nausicaa or Laputa, in that way it teaches us to reflect on the nice little moments in our small lives, which, at the end of the day, is all that most of us have.